The validator which can be set up via a configuration file. For command Interest validation, this policy must be combined with ValidationPolicyCommandInterest, in order to guard against replay attacks. Definition at line 42 of file validation-policy-config.hpp. Definition at line 38 of file validation-policy-config.cpp. Load policy from file filename. Definition at line 45 of file validation-policy-config.cpp. Load policy from direct input. Definition at line 55 of file validation-policy-config.cpp. Definition at line 62 of file validation-policy-config.cpp. Definition at line 76 of file validation-policy-config.cpp. References ndn::security::v2::validator_config::Rule::create(), ndn::tlv::Data, and ndn::tlv::Interest. Definition at line 244 of file validation-policy-config.cpp. 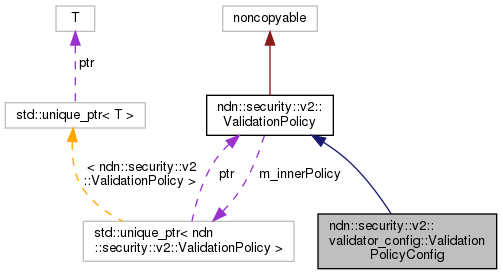 References ndn::tlv::Data, ndn::security::v2::getKeyLocatorName(), ndn::Data::getName(), ndn::security::v2::ValidationPolicy::hasInnerPolicy(), ndn::security::v2::ValidationError::POLICY_ERROR, and ndn::Name::toUri(). Definition at line 273 of file validation-policy-config.cpp. 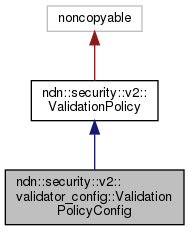 References ndn::security::v2::getKeyLocatorName(), ndn::Interest::getName(), ndn::security::v2::ValidationPolicy::hasInnerPolicy(), ndn::tlv::Interest, ndn::security::v2::ValidationError::POLICY_ERROR, and ndn::Name::toUri().